The dispute over the validity of the Haryana Sikh Gurdwara Management Act could be resolved only by taking the issue to the Punjab and Haryana High Court (HC) or the Supreme Court (SC), according to legal and constitutional experts. Haryana has taken a serious view of the legal interpretation tendered by the Attorney General (AG) to the Union Home Ministry. The state has termed it as a "misreading" of the law without taking into consideration the September 2002 judgment of a five-judge Constitutional Bench of the Punjab and Haryana High Court. Jalandhar: The United Sikh Movement on Saturday condemned the Punjab Government's decision to seek the Centre's intervention in the HSGMC issue. Addressing mediapersons here, movement president Bhai Mohkam Singh said instead of resisting central intervention in Sikh affairs, Chief Minister Parkash Singh Badal had been continuously “begging” for help from the BJP-led Union Government. The SAD core committee today expressed its resolve that it would not allow the division of the SGPC at any cost and would continue its struggle against Haryana's move to constitute a separate gurdwara panel for the state. Former Deputy Speaker of Punjab Vidhan Sabha and Congress leader Bir Devinder Singh has alleged that the Amritsar convention had been called off due to bickering between the SAD and the BJP. Aam Aadmi Party supremo Arvind Kejriwal launched a scathing attack on the Akali Dal in Sunam today. Kejriwal blamed the ruling SAD for the prevalent drug menace in the state. “Under the patronage of corrupt politicians, the drug trade is flourishing in the state. Even though the name of an Akali minister is being openly linked to the drug trade in the media, still no action has been taken against him. Congress president Sonia Gandhi today approved the candidature of Preneet Kaur for Patiala Assembly bypoll and Harminder Singh Jassi from Talwandi Sabo segment. The by-elections are slated for August 21. The private and mini-bus operators of the state today said they would not pay motor vehicle taxes, protesting the biased approach of the state government. They declared that they would not ply buses on Independence Day. Eminent lawyers and jurists are of unanimous view that since the Act has come into force with the issuance of notification by the Haryana Government, nobody can undo the law except by successfully challenging it in the higher judiciary. “Neither the present Governor nor his successor can review or recall the assent given to the relevant Bill either on his own or at the instance of the Centre. Once given, the Governor’s assent attains finality and nothing can be done to reverse the process,” senior advocate PP Rao said. Agreeing with this view, senior advocate KTS Tulsi said the Central Government’s power had come to an end on the SGPC issue as under Section 72 of the Punjab Re-organisation Act the extra-territorial jurisdiction was valid only till the successor state made its own law. Unless the new law enacted by Haryana was declared unconstitutional by a competent court, it would be in place, Tulsi said. Senior advocate Rakesh Dwivedi said the Centre could make a Presidential reference to the SC to decide the constitutionality of the law, but the better option would be to challenge it either in the HC or SC by the affected parties. Tulsi said the government, be it of the state or the Centre, was not expected to interfere in religious matters and as such, it would not be advisable for the executive to meddle with the issue. Expressing similar views, former Additional Solicitor General Mohan Jain said the situation was somewhat akin to a final HC verdict, which could be challenged only in the SC. The same way, nothing could be done with a law enacted by the state and approved by the Governor, except for taking the issue to the higher judiciary for adjudication on its validity, constitutional or otherwise. Another senior advocate, CS Vaidyanathan, is also of the firm view that the Central Government was left only with the option of making a Presidential reference if it felt that the state law was running counter to the SGPC Act enacted by Parliament. Keeping in view the reaction of the Haryana's Governor-designate Kaptan Singh Solanki, Haryana has shot off a letter to the AG pointing out highlights from the 2002 HC judgment as upheld by the apex court earlier this year. Solanki has opined that the state must obey the Centre’s directive seeking revocation of the HSGMC Act. Manjit Singh Khaira, a constitutional expert and senior HC lawyer, has echoed the sentiments of the Haryana Government by pointing out that Para 63, 64 and 88 of the Civil Writ Petition titled ‘Kashmir Singh versus Union of India’ clearly stated that the Haryana Government was fully empowered to enact the Haryana Sikh Gurdwara Management Act. Para 63 of the judgment reads: “Section 72, dealing with general provisions about statutory corporations under the Act of 1925, is not intended to be a measure for all times to come... All measures taken thereunder, unless specifically said otherwise, like the Board for Bhakra Nangal and Beas projects, are temporary in nature”. “...the Act of 1925 would not apply to the said state, as mentioned above; the Board would no more be an inter-state body corporate. The power to legislate in that case would not be with the Central Government under Entry 44 List -1 (Union List)...."
Para 88 reads: "As mentioned above, the Act of 1925 is purely a state Act and the power to enact provisions thereof would be of the state government, be it Entry 32 in List II or Entry 28 in List III i.e. Residuary List." The then member of the Constitutional Bench and now a SAD MLA, Justice Nirmal Singh, said: “I stand by my judgment, but it is being misinterpreted by the Haryana Government to present its case.” He said the Sikh Gurdwara Act, 1925 deals with boards namely the SGPC, Sikh Gurdwara Judicial Commission, Sikh Gurdwara Tribunal and the Sikh Gurdwara Election Commission. As the SGPC area of operation spread into more than one state on November 1, 1966, it became an inter-state body corporate and any modification with regard to this board could only be done by the Centre. “The judgment was with regard to the Sikh Gurdwara Judicial Commission (SGJC), which is not an inter-state board. Haryana is trying to misinterpret provisions with regard to the SGJC as being applicable to the panel, which is incorrect,” he added. Panchkula: Over 450 employees of the SGPC posted at several gurdwaras across the state have a reason to cheer as the HSGMC has decided to absorb them. This was stated by Didar Singh Nalvi, HSGMC ad-hoc member. Sources said over 450 employees (nearly 130 from Punjab) are working in 25 gurdwaras in Haryana. Of these, eight gurdwaras are managed by the SGPC and the remaining by local management committees. Besides, each gurdwara employs nearly 40 contractual and a number of daily wage workers. These religious institutions have over 2,000 acres of land under their possession, the sources said. New Delhi: Amritsar MP Capt Amarinder Singh has welcomed Akal Takht's intervention and said it should serve as a reality check for Chief Minister Parkash Singh Badal, who is resisting Haryana's move. "I welcome the Akal Takht's move asking the SAD and the HSGMC to call off their conferences. The Akali Dal should understand that every state has the right to manage their gurdwaras," Amarinder Singh said. He reiterated his party's stand that Haryana was well within its legal right to pass a separate Act to manage gurdwaras under its jurisdiction. Jalandhar: Prem Singh Chandumajra, SAD MP from Anandpur Sahib, on Saturday said an All-India Sikh Gurdwara Act would put to rest the controversy over separate Haryana gurdwara panel. Addressing the media here, he said: “I will urge the SAD core committee to take up the matter with the Centre." Welcoming the Akal Takht edict to call off Sunday’s conclave, Chandumajra said the Akal Takht's edict could not be defied by the SAD. With its timely intervention, an ensuing confrontation had been averted, he said. 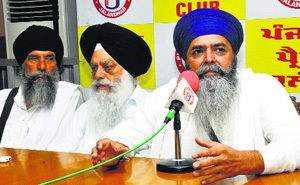 Jalandhar: Simranjit Singh Mann, president, SAD (Amritsar), on Saturday insisted that the SGPC should not be bifurcated. He said SGPC was parliament of Sikhs and its powers should not be diluted. He, however, said he was not supporting CM Parkash Singh Badal's stand on the matter. 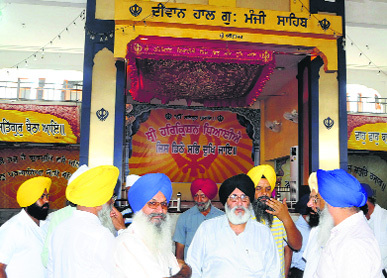 Welcoming Akal Takht's decision to call off the SAD conclave, Mann said the Akal Takht's timely move had averted the situation from being worsening. He said the decision to excommunicate three Haryana Sikh leaders should also be reversed. Chandigarh: Noted lawyer and Aam Aadmi Party leader HS Phoolka has said the Haryana Governor had already given his nod to the Bill passed by the Assembly and as such it could not be revoked as indicated by the Governor-designate KS Solanki. "Now there are only two remedies left - the Haryana Assembly repeals or amends the Act or the high court or the Supreme Court adjudicate the case. Neither the Haryana Government nor the Central Government or the President can withdraw the Bill," Phoolka said. On the SAD's next course of action, he merely said they would take a decision on it as per the sentiments and the traditions of the panth. On why the SAD was not taking legal recourse, he said court cases consumed a lot of time and that was why the party had resorted to struggle. He hoped that the new Haryana Governor would look into the issue and help resolve it. On the election of excommunicated Haryana Sikh leaders Jagdish Singh Jhinda and Didar Singh Nalvi to the key posts in the HSGMC, Badal said it was a clear violation of the Akal Takht edict and the Akal Takht Jathedar should look into the matter. On the possibility of holding talks with Jhinda and Nalvi, he restricted himself to saying they neither appeared before the Akal Takht nor held talks with the panel sent by the Akal Takht. He said the Akali Dal had never misused Akal Takht. The CM said the SAD would be sending a three-member committee to UP to meet CM Akhilesh Yadav and urge him to ensure safety of the life and property of Sikhs in Saharanpur. Sources said the SAD was expecting “some positive developments” from the Centre over the next couple of days and that is why it refrained from making any major announcement about its future strategy. “Chief Minister Parkash Singh Badal took the decision after BJP leader Shanta Kumar told him that in case he stepped down, the BJP will not support the government under Sukhbir Badal, he said. Kumar, BJP’s Punjab affairs in charge and MP from Kangra in Himachal, had been deputed by Union Home Minister Rajnath Singh to convince Badal to call off the SAD ‘morcha’. Bir Devinder claimed that Sukhbir subsequently went to Delhi and met Rajnath as well as Finance Minister Arun Jaitley. “Both the leaders told Sukhbir that the BJP cannot afford to go against the Sikh sentiments in Haryana ahead of the Vidhan Sabha elections in that state,” Bir Devinder said in a statement. Senior SAD leaders, however, rubbished the allegations as baseless. “The convention was cancelled at the last minute due to the clashes in Saharanpur, and not because of any other reason,” said Anandpur Sahib MP Prem Singh Chandumajra. Aam Aadmi Party supremo Arvind Kejriwal launched a scathing attack on the Akali Dal in Sunam today. Kejriwal blamed the ruling SAD for the prevalent drug menace in the state. “Under the patronage of corrupt politicians, the drug trade is flourishing in the state. Even though the name of an Akali minister is being openly linked to the drug trade in the media, still no action has been taken against him. An honest politician would have never allowed the situation to deteriorate so much. There is a direct link between such politicians and the smugglers. If AAP comes to power, we will curb drug trade immediately. We reduced corruption drastically in New Delhi in 49 days.” he said. On AAP choosing not to contest the Haryana assembly elections, Kejriwal said, “We do not have the structure and the means to contest elections at various places at the same time. I want to focus on Delhi first. Our national executive will soon take a final decision on the matter. In response to a query about the absence of an organisational structure, he said that booth and village-level committees had been formed to strengthen the structure. “My aim is to have ten workers of AAP manning each polling booth in the by-polls at Patiala and Talwandi Sabo and later all over the state,” he said. Sunam: The political affairs committee of AAP will on Sunday announce the candidates for the Patiala and Talwandi Sabo bypolls. An eight-member ad hoc committee had short-listed four candidates for Talwandi Sabo seat and three for Patiala. Sangrur MP Bhagwant Mann said Kejriwal would announce the candidates. Aam Admi Party’s (AAP) national convener Arvind Kejriwal today paid obeisance at Takht Sri Damdama Sahib. Amid speculations that an outsider may be given the ticket to fight from Talwandi Sabo constituency, Kejriwal faced opposition from local party leaders. They said they would not support any candidate from outside the constituency. “The frontrunner is singer Balkar Sidhu, who is from a village in Bathinda district. But since his village does not fall within the constituency, we are still mulling over the issue,” said Jarnail Singh, National Observer of AAP (Punjab). The candidature of Preneet, three-time former MP from Patiala who remained the Union Minister of State for External Affairs in the previous UPA Government, ensures that the Patiala segment remains within the family. The seat was vacated by Capt Amarinder Singh after his victory against BJP’s Arun Jaitley from Amritsar Lok Sabha segment. Preneet had lost the recently held Lok Sabha election to Aam Aadmi Party’s Dharamvira Gandhi. From Talwandi Sabo, the Congress has named former minister Harminder Singh Jassi as its candidate. Jassi had in 2012 lost the Bathinda (Urban) segment to SAD’s Sarup Chand Singla, in what was seen as an indication of the declining clout of Dera Sacha Sauda in Punjab politics. Jassi’s daughter is married to the son of Gurmeet Ram Rahim Singh, the head of Dera Sacha Sauda. Chandigarh: The Election Commission of India on Saturday issued the notification for the Talwandi Sabo and Patiala assembly bye-elections. VK Singh, Chief Electoral Officer, Punjab, said that polling would be held on August 21, from 7:00 am to 6:00 pm. He said that nomination for the bye-elections would continue till August 2. The operators, who run 7,200 buses daily, alleged the government’s transport policy was unfair and in favour of a bus firm owned by the Badal family. They alleged even Regional Transport Officers (RTO), who set the time tables, were helpless as the close aides of the Badal family set these. General secretary of private bus operators’ association RS Bajwa said for the first time in the country, the tax on luxury buses was less as compared to ordinary buses. He said most luxury buses in the state were run by a company owned by the Badal family directly or indirectly. Bajwa alleged the transport industry in the state was facing huge losses due to unfavorable policies of the state government. “The motor vehicle tax that was Rs 2.25 per km earlier has been hiked to Rs 3.13 per km. Even the quarterly tax on mini-buses has been raised from Rs 7,500 to Rs 12,500,” he said.